This RSA handbook is a guide to getting to grips with what is called the ‘evidence agenda’ in arts and cultural learning – it is designed to make it easier to ‘do’ evidence and evaluation. Throughout the guide,the RSA Action and Research Centre talks about the attitudes, the approaches and the key skills of an Evidence Champion. There’s also advice on the things you can do right now with the teachers, arts and cultural educators, funders and evaluators you collaborate with to make arts and cultural learning more evidence-rich. Londesborough, M., Partridge, L.,Bath, N., Grinsted, S., Landreth Strong, F. (2019). 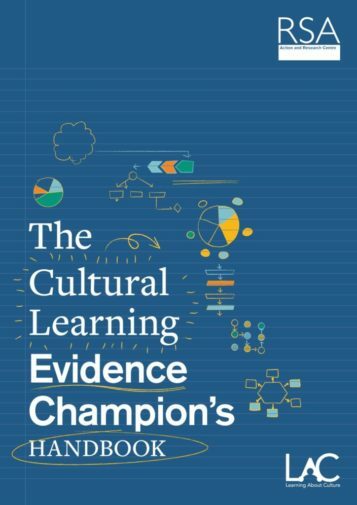 The Cultural Learning Evidence Champion's Handbook. UK: RSA. This online repository has been developed and delivered by Angus McLewin Associates (AMA) for the Sidney De Haan Research Centre for Arts and Health, Canterbury Christ Church University on behalf of the Special Interest Group for Arts, Health and Wellbeing within the Royal Society for Public Health. It was made possible through generous funding from the Lankelly Chase Foundation.